Prism Sound Callia DAC review | What Hi-Fi? Prism Sound has spent the 30-odd years of its existence serving the pro audio community – until now, that is. The Callia is the company’s first foray into the consumer market. 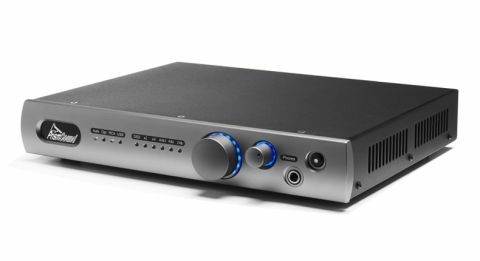 It’s a DAC and a headphone amp – exactly the kind of product the high-end two-channel consumer market is thriving on at the moment. But even passing acquaintance with Callia (from the Greek for ‘beautiful’) is enough to give Prism Sound’s pro audio heritage and credentials away. It’s a comprehensively specified device. On the rear panel you’ll find optical, coaxial and USB inputs, alongside RCA and XLR analogue outputs. There’s also a switch to adjust the headphone output level, depending on the sensitivity of your headphones. The headphone socket itself is a 6.3mm affair on the front panel, where it sits to the right of a couple of rows of LED indicators (input, sample rate and bit depth indicators), a volume control (also illuminated by a ring of LEDs, and which doubles as input selector) and a smaller volume control for the headphone output. The Callia is capable of accepting PCM signals of up to 384kHz. Anything higher than 192kHz is downsampled before it’s passed to the pair of DAC chips under the bonnet – these are supposedly identical to the Cirrus Logic chips in Prism Sound’s pro converters. DSD64 and DSD128 signals are also converted, to PCM. Build is robust, as it should be at this sort of money, and the controls function smoothly. The Callia doesn’t look anything special, certainly not compared with our favourite DAC at around this price, Chord’s eccentric Hugo 2, but it’s purposeful enough. It’s quite big for desktop use, but will look a little bit lost as part of a full-size separates system. We start by hooking the Prism to a MacBook Air (running Pure Music software) via USB and play a 24-bit/192kHz file of Norah Jones’ reading of Tom Waits’ The Long Way Home. This 2013 Blue Note recording is the definition of good taste – spacious and focused, each element isolated securely on its part of the soundstage yet integrated neatly into the performance as a whole. Jones’s voice is close-mic’d, centred on the stage and alive with details of her palate-noises, breath management and elegant, effortless timbre. The Callia takes this lavish and information-heavy file and does good work with it. The minute differences in individual guitar strums, the casual precision of Jones’ singing and the overall responsiveness of the band are all described in full. Timing is pretty good – the impression of musicians relating and reacting to each other is discernible. And there’s an agreeable even-handedness to the way the frequency range is described – there’s no undue emphasis at any point, just a convincingly natural journey from the lowest frequencies to the highest. But while this isn’t the most dynamic recording (Norah Jones records are never designed to startle the listener), there’s an element of confinement to the Callia’s sound – it’s an undemonstrative listen. Perhaps the years of pro audio tuning are manifesting themselves here. As an analytical tool, the Callia has everything going for it, but as a device to bring the emotion of a recording to the fore, it is found wanting. We resolve to give it a bit more of a chance to communicate on a gut level by running through a 16-bit/44.1kHz CD-quality file of PJ Harvey’s 50ft Queenie. This recording is the aural equivalent of being chased across a pub car park by some vengeful types – but while all of the exquisite detail loaded into the song by Steve Albini’s production comes through in torrents, the delirious levels of attack are pretty much absent. None of Harvey’s malevolence is properly communicated, and the dynamic variance (which is pronounced on this recording) is flattened to an unhappy degree. So if it’s the details of a drum-triplet you want to hear, or the minutiae of plastic plectrum against steel string, or the ragged gasp for breath as a singer launches into a final chorus, the Prism Sound Callia is just the device you want. It’s a wide-open listen, describes a soundstage well and has a pleasantly naturalistic way with timing. But if you’re also concerned with the more visceral aspects of music, of the distance a full-scale symphony orchestra with its dander up can put between the quietest and loudest parts of a piece, or of the abandonment a determined three-piece can bring to a blues arrangement, the Callia will be unsatisfactory.